Leaked photographs have forced Vauxhall to reveal prematurely details of its next Astra, powered by an aluminium I4 gasoline engine; its predecessor has a cast iron cylinder block. Vauxhall’s seventh-generation Astra reaches production later this year from the company’s Ellesmere Port plant in Cheshire. Based on an all-new lightweight vehicle architecture with new design, powertrains and connectivity technology, Astra will receive its world premiere at the 2015 Frankfurt Motor Show (September 17-27). Depending on model and trim level, the car will be up to 200kg (130kg on average) lighter than its predecessor. The new vehicle architecture plays a major role in the weight reduction. Every component was checked for compact design and lightweight materials. The body shell weight was reduced by 20 per cent from 357kg to 280kg. Additionally, chassis-related measures resulted in a further 50kg weight loss. These include high-strength and ultra-high-strength low-weight steels, compact sub-frames as well as weight reductions to the front and rear axle. The powertrain portfolio includes gasoline and diesel units ranging from 100PS to 200PS. The highlight of the engine range is the new 1.4-litre (145PS) ECOTEC direct injection turbocharged four-cylinder unit from the same family as the one-litre, three-cylinder engine fitted in Corsa, Adam and Viva. The engine delivers maximum torque of up to 250Nm, with maximum power available between 1,800 and 4,000 rev/min. The new aluminium engine block weighs 10kg less than the cast iron block of the current 1.4-litre turbo. There is also a base-level 1-litre ECOTEC (105PS) gasoline engine and a 1.6-litre CDTi ‘Whisper Diesel’ range with outputs from 110 to 160PS. The new Astra is also smaller, contributing to the weight reduction. With a total length of 4.37m it is almost 5cm shorter than its predecessor. With a height of 1.46m it is also 2.6cm lower. The drag coefficient is below 0.30. The wheelbase has been reduced by 2cm. 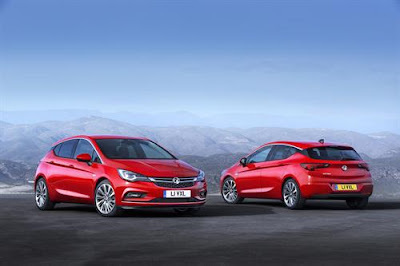 The new Astra is the first new Vauxhall model that will be available with the personal connectivity.